Poaching eggs is sometimes viewed as a dark art best left to the cafe, but Jill Dupleix shows you how easy it can be. Most people are so scared of poaching eggs they only ever order them in a cafe. I was like that once. Who needs that sort of stress and trauma on a Sunday morning, when all you want to do is sit down to the perfect poached egg on your avocado-on-toast? But I've learnt, thanks to brilliant people like food scientist Harold McGee and the Food Lab's J. Kenji Lopez-Alt, that as long as you remember these three things, it will work every time. 1. The egg must be as fresh as possible. Non-negotiable. 3. Use a soup ladle to lower the egg into the simmering water. First, three-quarter fill a medium-to-large pan with water and bring to a gentle simmer, with little bubbles coming up from the base. Add 1 tsp salt and 2 tbsp vinegar – the acidity will help the egg white to come together and coagulate, so you don't get all those ghostly, wispy, watery wipe-outs. Now, here's the thing: crack an egg into a small fine-meshed strainer set over a small bowl, and allow the excess egg white – the bits that would otherwise go wispy – to drain away. Don't worry, you'll still have plenty of firm egg white surrounding the yolk. Tip the egg gently into a soup ladle. Give the water a good swirl with a wooden spoon, then gently lower the soup ladle into the centre, allowing the egg to float off. The swirling water should help the egg whites wrap themselves around the egg yolk. Poach for 2½ to 3 minutes, depending on how you like your eggs – very runny, or softly runny. (Keep cooking for up to 3½ to 4 minutes if runny eggs give you the heebie-jeebies.) To check, lift the egg out with a slotted spoon and touch it with your finger; it should still be soft and springy. Drain the egg on a paper towel, trim any raggedy edges, and serve. For avocado on toast with poached egg and chives: roughly crush a peeled and pitted avocado with 1 tbsp lemon juice, sea salt and pepper. 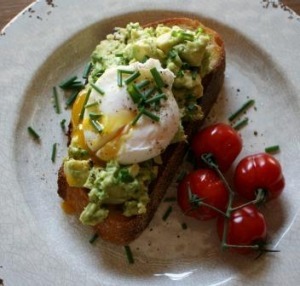 Toast or grill four thick slices of sourdough bread and thickly spread with crushed avocado. 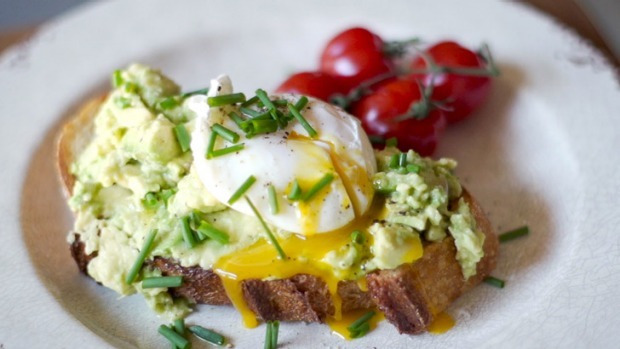 Top each slice with a poached egg, scatter with chives and serve with roasted cherry tomatoes. Serves 4.